Rep. Jeff Keicher takes the oath of office at Dayton Farms in Sycamore on Tuesday, joined by his family. 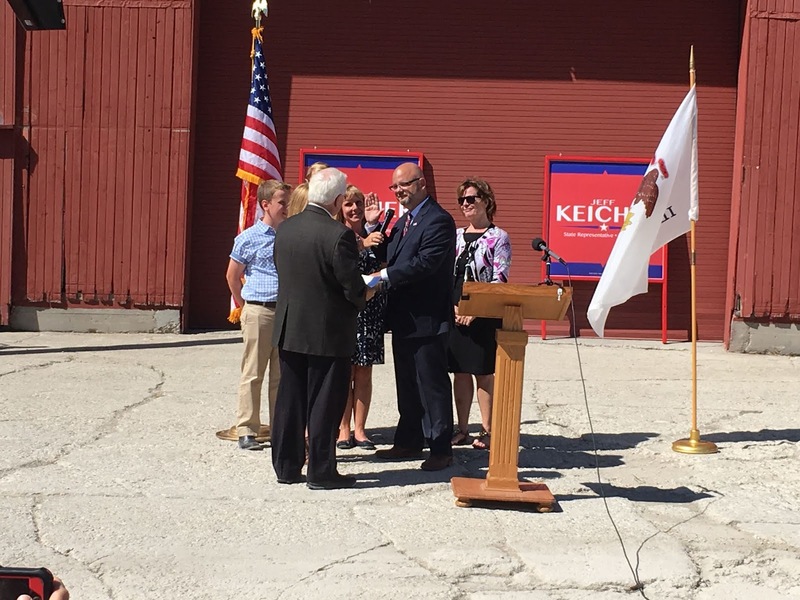 SYCAMORE– Joined by community leaders, family and friends, Sycamore businessman Jeff Keicher took the oath of office at Dayton Farms on Tuesday to become the new State Representative for Illinois’ 70th District, encompassing portions of Boone, DeKalb, and Kane Counties. Keicher replaces former Representative Bob Pritchard, who resigned July 1 to accept an appointment to the Board of Trustees of Northern Illinois University. Following through on a commitment he made previously, Representative Keicher will sign official paperwork declining state health insurance benefits, as well as opting out of the pension system for state legislators. Representative Keicher was appointed to serve out the remainder of former Representative Pritchard’s term, which expires in January 2019. Until further notice, Keicher will maintain Pritchard’s former district office, located at 2600 DeKalb Avenue, Suite C in Sycamore. Representative Keicher is a graduate of Northern Illinois University with over 20 years of professional experience in the insurance industry. In 2006, he opened his own State Farm Insurance Agency in Sycamore.